I’ve been volunteering for DRS since early December last year, predominantly in the warehouse, sorting clothes for future shipments to France and Syria. I have extensive experience of working in the voluntary sector and providing supporting to the vulnerable members of our society but the experience I am just about to describe, brings the humanitarian support to the new level, from my perspective. Bob, Rose and I left Derbyshire on 10th of March to France, where we stayed for 4 days. Our trip to Calais was triggered by the urgent need to deliver a wheelchair to a little girl with cerebral palsy who got to the camp with her family a few months prior and the urgent call for incontinence pads for women in the camp. 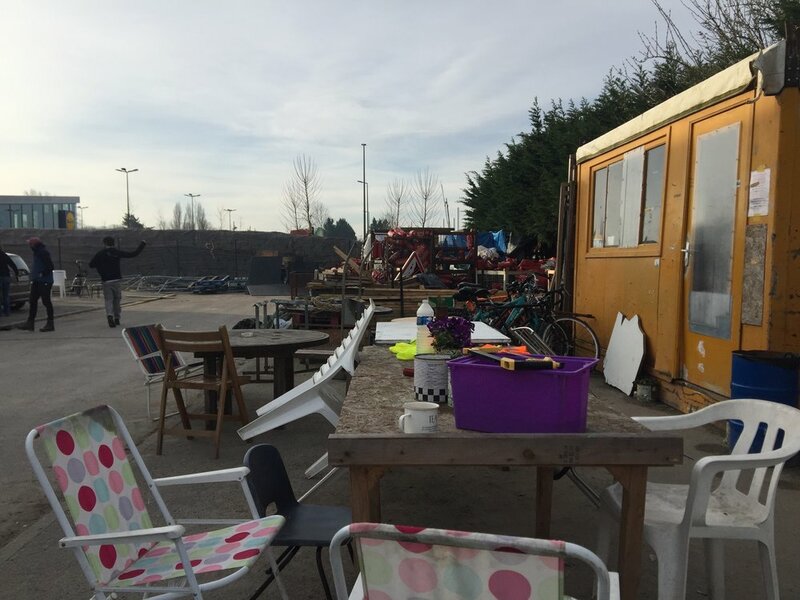 Unlike “The Jungle” (the former camp in Calais), the camp in Dunkirk is an official one and it’s run by a not for profit organisation called AFIJE with active support from L’Auberge des Migrants (charity which runs a warehouse in Calais), RCK (Refugee Community Kitchen), GSF (Gynecologists Without Frontiers), Utopia 56 (a French charity providing support to refugees) and recently Help Refugees. Help Refugees, based in London, seems to be bringing all of the NGOs and voluntary organizations together to ease communication and make the system more efficient. Unlike in the old camp in Calais, refugees in the Dunkirk camp have been provided with more stable accommodation. Instead of tents, they live in little wooden shacks, which unfortunately are still cramped and due to them being built quickly and cheaply, already in a state of dilapidation. Originally these shelters met International standards but are not really designed for European winters. There are rumours that the shelters will be rebuilt to a higher standard but also that the camp will be closed and the refugees distributed as happened with the Jungle. Currently there are ca. 1500 refugees in the camp, 10% of whom are women. 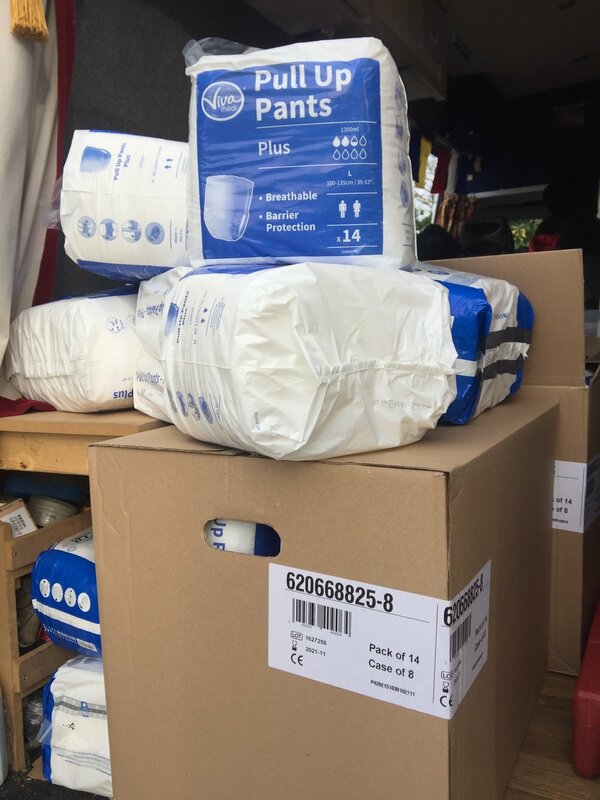 It’s been reported that a lot of them have been suffering from abuse when using toilets at night, hence the request for incontinence pads, as a short term solution to a rather worrying issue, one of many in the camp. For a more information on the current situation in the camp, please read Katie Ollife’s fantastic summary, which you can find here. Following a visit in the camp, instantaneously you feel angry, you want to help, you feel like this should not be happening in this day and age in Europe and only such a short distance away from the British shore. Unfortunately, the reality is different. 1500 people plus ca. 600 displaced kids on the streets of Calais live in inhumane conditions, with no roof over their heads and no safety, exposed to abuse and harm. If not for the tremendous work of volunteers in the Refugee Community Kitchen many people would go hungry. 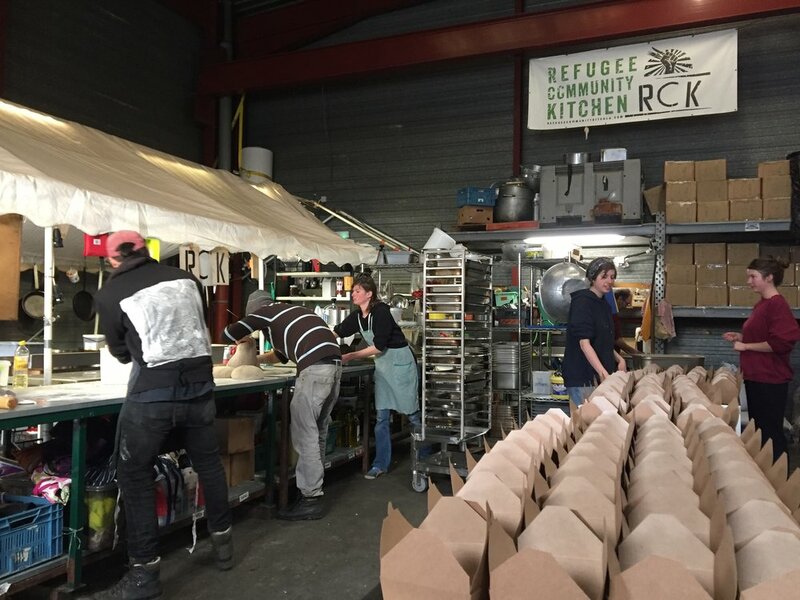 RCK provide every single day - hot food to 600 people in Dunkirk, stock two free shops in Dunkirk so 1500 people can cook for themselves and make flapjacks for the refugees on the streets of Paris. The Utopia56 volunteers, on their nightly “maraudes” (cruisers) deliver hundreds of the RCK hot meals to the refugees on the streets of Calais. L’Auberge warehouse (which is also the home of RCK, Utopia56 and Help Refugees) is the centre of the distribution network which we supply. Here the clothes, shoes, sleeping bags, blankets, toiletry packs & pots and pans, which DRS collected and delivered are stockpiled and directed to where they are needed, be it the camp in Dunkirk or the streets of Calais or Paris. DRS sorting and labelling gained great praise for its thoroughness. GSF, who look after women and the children in the Dunkirk camp, have a smaller separate warehouse. Once we delivered the goods to the camp, we spent the rest of the time on completing various duties around the L’Auberge warehouse. I joined a bubbly group of volunteers and helped peeling two sacks of garlic for dinner and later supported the kitchen with Bob and Rose in dishing out hundreds of warm meals which would later be distributed amongst the displaced kids on the streets of Calais. We also worked in the warehouse, sorting shoes and clothes, going through donated underwear and socks, counting and re-bagging them. 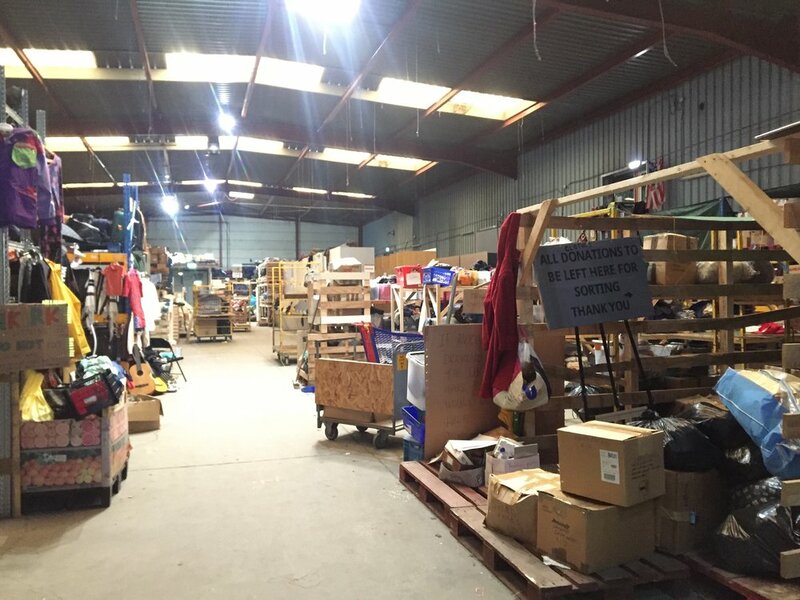 L’Auberge have a tremendous system in the warehouse, with sections dedicated to different tasks – one for donations, another one for a charity shop, where culturally unsuitable items are being sold to visitors to raise funds, another one with neatly constructed and labelled clothes feeders and others with rucksacks, shoes, blankets and tents. There’s a tea and coffee corner and every volunteer gets fed a beautiful vegetarian meal at lunchtime (curry, rice & salad), leftovers from dinners cooked for the refugees on the previous day. The vibe in the warehouse and the kitchen is very positive although you can tell the volunteers are tired and in need of continuous support. I was told summers are the hardest seasons as a lot of longer term volunteers leave the site to work on the festivals to earn some money. A lot of people don’t realise that help is still very much needed in Calais, despite the old camp being gone. There are still hundreds of people in desperate need of our support there. Anyone thinking of volunteering longer term may be able to get accommodated. For more information, contact Help Refugees. 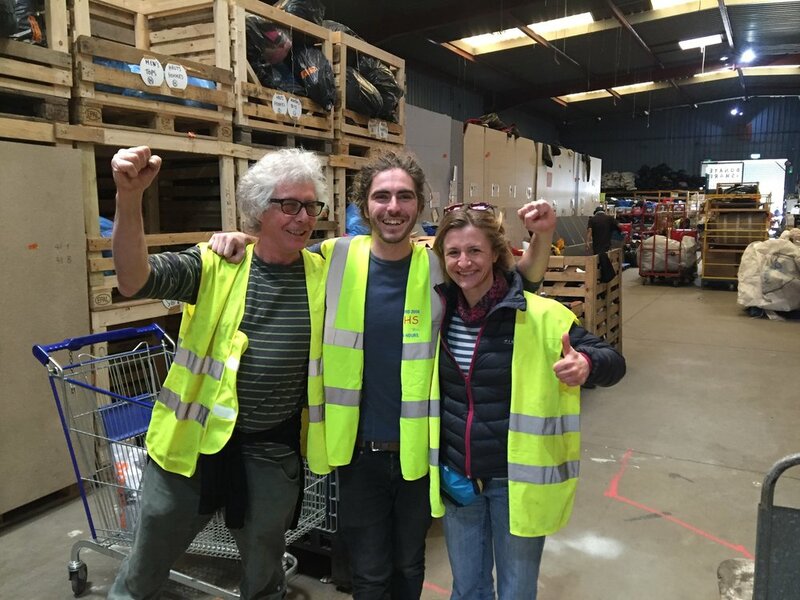 I am planning to return to Calais soon to help out in the camp and the warehouse again but for now, I will carry on volunteering, fundraising and raising awareness of the refugee situation in Europe with Derbyshire Refugee Solidarity. I would urge anyone who has a little time to spare, especially skilled workers with experience of working with the difficult social issues, to consider volunteering in the camp too. It’s a difficult experience but also a very rewarding one. Personally, it helped me reconnect with my values and appreciate what I have in life even more. Since the refugee crisis has not been televised much lately, I believe it is even more important for us to act now because in some way we all play a part in this crisis.